Aleksandr Vasilyevich Suvorov, Count Rimniksky, Prince Italiysky, Russian field marshal, was born at Moscow on the 24th of November 1729, the descendant of a Swede named Suvor who emigrated to Russia in 1622. He entered the army as a boy, served against the Swedes in Finland and against the Prussians during the Seven Years' War. After repeatedly distinguishing himself in battle he was made a colonel in 1762. He next served in Poland, dispersed the Polish forces under Pulawski, stormed Krakow (1768) and was made a major-general. In his first campaigns against the Turks in 1773-74, and particularly in the battle of Kosludscki in the latter year, he laid the foundations of his reputation. In 1775 he suppressed the rebellion of Pugachev, who was decapitated at Moscow. From 1777-83 he served in the Crimea and the Caucasus, becoming a lieutenant-general in 1780, and general of infantry in 1783, on the conclusion of his work there. From 1787 to 1791 he was again fighting the Turks and won many victories; he was wounded at Kinburn (1787), took part in the siege of Ochakov, and in 1788 won two great victories at Focsani and on the Rimnik. For the latter victory, in which an Austrian corps under Prince Josias of Saxe-Coburg participated, Catherine the Great made him a count with the name Rimniksky in addition to his own name, and the emperor Joseph II created him a count of the Holy Roman Empire. On the 22nd of December 1790 Suvorov stormed Ismail in Bessarabia, and the sack and the massacre that followed the capture equals in horror such events as the "Spanish Fury" and the fall of Magdeburg. He was next placed at the head of the army which subdued the Poles, and repeated the triumph, and some of the cruelties, of Ismail at Warsaw. He was now made a field marshal, and was retained in Poland until 1795, when he returned to St. Petersburg. But his sovereign and friend Catherine died in 1796, and her successor Paul dismissed the veteran in disgrace. Suvorov then lived for some years in retirement on his estate of Konchauskoy, near Moscow. He criticized the new military tactics and dress introduced by the emperor, and some of his caustic verse reached the ears of Paul. His conduct was therefore watched and his correspondence with his wife, who had remained at Moscow -- for his marriage relations had not been happy -- was tampered with. On Sundays he tolled the bell for church and sang among the rustics in the village choir. On week days he worked among them in a smock frock. But in February 1799 he was summoned by the tsar to take the field again, this time against the French Revolutionary armies in Italy. The campaign opened with a series of victories (Cassano, Trebbia, Novi) which reduced the French government to desperate straits and drove every French soldier from Italy, save for the handful under Moreau, which maintained a foothold in the Maritime Alps and around Genoa. Suvorov himself was made a prince. But the later events of the eventful year went uniformly against the allies. Suvorov's lieutenant Korsakov was defeated by André Masséna at Zürich, and the old field marshal, seeking to make his way over the Swiss passes to the Upper Rhine, had to retreat to the Vorarlberg, where the army, much shattered and almost destitute of horses and artillery, went into winter quarters. Early in 1800 Suvorov returned to St. Petersburg in disgrace. Paul refused to give him an audience, and, worn out and ill, he died a few days afterwards on the 18th of May 1800 at St. Petersburg. Lord Whitworth, the English ambassador, was the only person of distinction present at the funeral. Suvorov lies buried in the church of the Annunciation in the Alexandro-Nevskii monastery, the simple inscription on his grave being, according to his own direction, "Here lies Suvorov." But within a year of his death the tsar Alexander I erected a statue to his memory in the Field of Mars, St. Petersburg. His son Arkadi (1783-1811) was a general officer in the Russian army during the Napoleonic and Turkish wars of the early 19th century, and was drowned in the river Rimnik in 1811. His grandson Alexander Arkadievich (1804-1882) was also a Russian general. Among the Russians the memory of Suvorov is cherished to this day. A great captain, viewed from the standpoint of any age of military history, he is especially the great captain of the Russian nation, for the character of his leadership responded to the character of the Russian soldier. In an age when war had become an act of diplomacy he restored its true significance as an act of force. He was reckless of human life, bent only on the achievement of the object in hand, and he spared his own soldiers as little as he showed mercy to the population of a fallen city. He was a man of great simplicity of manners, and while on a campaign lived as a private soldier, sleeping on straw and contenting himself with the humblest fare. But he had himself passed through all the gradations of military service; moreover, his education had been of the rudest kind. His gibes procured him many enemies. He had all the contempt of a man of ability and action for ignorant favorites and ornamental carpet-knights. But his drolleries served, sometimes to hide, more often to express, a soldierly genius, the effect of which the Russian army has not outgrown. If the tactics of the Russians in the war of 1904-05 reflected too literally some of the maxims of Suvorov's Turkish wars, the spirit of self-sacrifice, resolution and indifference to losses there shown was a precious legacy from those wars. 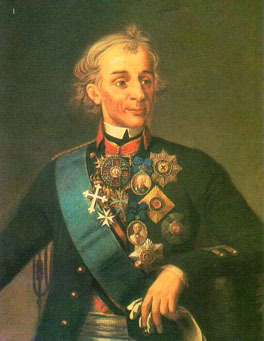 Dragomirov avowed that his teaching was based on Suvorov's practice, which he held to be representative of the fundamental truths of war and of the military qualities of the Russian nation.